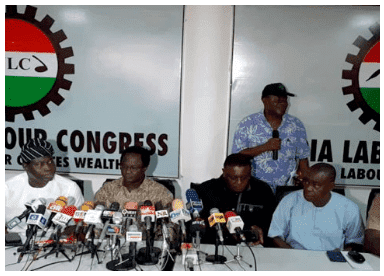 The Nigeria Labour Congress, NLC, has condemned threat by the Nigeria Governors Forum, NGF, to sack workers if the new national minimum wage of N30,000 is implemented. Ayuba Wabba, NLC President, in a statement yesterday in Abuja, said the threat was not new as they are used to such tricks. Mr Wabba was reacting to the statement made by the Chairman of NGF, Abdulaziz Yari, governor of Zamfara, threatening to sack workers on the account of the new national minimum wage of N30, 000. According to Wabba, the threat to sack workers is not new in the struggle for review of national minimum wage. “Therefore, the current one by the governor of Zamfara cannot be used to intimidate labour. “Pro rata with the minimum wage they want to force down the throats of Nigerian workers, ‘’ he said. Mr Wabba urged each of the state governors to go to their respective state and inform workers on their individual position on the new national minimum wage of N30,000. The NLC president further urged workers to remain steadfast and firm on their rights to decent wages and improved living conditions. “We hereby reiterate our directive to Nigerian workers to vote out any politician or political party that refuses to pay the new national minimum wage of N30,000. “We shall continue to consolidate our efforts to strengthen already existing platforms and structures to give teeth to our resolve to vote out anti-labour governors and politicians in the forthcoming 2019 general election," Wabba said. He called on President Muhammadu Buhari to speedily present to the National Assembly the bill on the National Minimum Wage for appropriate amendment and implementation. “At the National Minimum Wage Tripartite Negotiation Committee, state governments were represented by six states, one state from each of the six geopolitical zones."